A US judge has allowed the estranged wife and daughter of ailing actor Dennis Hopper to live on his property during the couple's divorce. 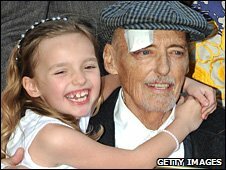 The terminally ill Easy Rider star has also been ordered to pay support of $12,000 (£7,900) a month to Victoria Duffy Hopper, his wife of 14 years. She has accused his family of trying to cut her out of the cancer-stricken actor's will, which they have denied. A pre-nuptial agreement calls for her to lose her stake if they divorce. Hopper, who is suffering from prostate cancer, did not attend the latest hearing and was described by his legal team as "desperately ill". His three adult children from previous marriages were in attendance but did not speak. The rulings come after two months of wrangling and allegations of abuse by both sides. Last month, a judge ruled that Mrs Hopper must stay at least 10ft (3m) away from her husband after the actor said he wanted to eliminate unnecessary stress. Mrs Hopper, 42, said the actor threatened her, smoked marijuana around their daughter and that his illness had left him unable to make sound decisions. Superior Court Judge Amy Pellman told both sides there need to be "street-cleaning on both sides of this street," noting the couple's seven-year-old daughter Galen is about to experience the traumatic loss of her father. Having her extended family "in a war with her mother is not in her best interests", Pellman said. Another hearing on how to divide Hopper's life insurance policy will be held in May.